Equipped with a 25 cc two-cycle engine, the Poulan Pro PPB25 gas-powered handheld leaf blower produces air speeds up to 215 mph and airflow up to 430 cfm. With cruise control and trigger-operated variable speed control, this lightweight blower is powerful, versatile, easy-to-use, and perfect for year-round residential lawn maintenance. The ECHO PB580T Gas Backpack Blower features a 58.2cc professional-grade, 2-stroke engine with a tube-mounted throttle. It delivers 510 CFM and 215 MPH blowing performance for a powerful impact. A unique vented backpad circulates air around the user for increased comfort in hot weather. Its compact yet durable design offers easy transport around your yard area. 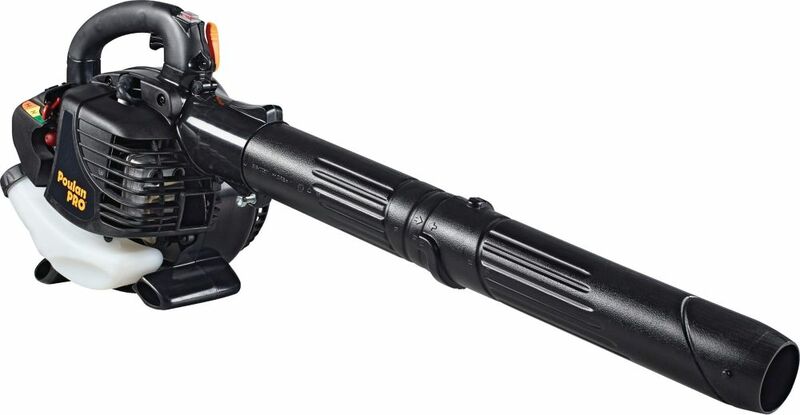 The EGO POWER+ 580 CFM Blower is the most powerful cordless blower in the industry! Turbine fan engineering, inspired by advanced aeronautics technology, performs better than premium gas-powered models. The high-efficiency brushless motor delivers longer run time, low vibrations and an extended motor life. The included spread nozzle attachment make clearing debris even easier. This quiet, light-weight and compact blower gets the job done easier and faster! Experience Power Beyond Belief without the noise, fuss and fumes. 25cc 2-Cycle Gas Leaf Blower, PPB25 Equipped with a 25 cc two-cycle engine, the Poulan Pro PPB25 gas-powered handheld leaf blower produces air speeds up to 215 mph and airflow up to 430 cfm. With cruise control and trigger-operated variable speed control, this lightweight blower is powerful, versatile, easy-to-use, and perfect for year-round residential lawn maintenance. 25cc 2-Cycle Gas Leaf Blower, PPB25 is rated 2.5 out of 5 by 10. Rated 5 out of 5 by Richard from The blower was reasonable priced and very well built. I... The blower was reasonable priced and very well built. I have used it several times already and have not had any problems with it so far. Rated 1 out of 5 by Ghia74 from Sorriest POJ I have ever owned Has always been hard to start, and will not restart after using for 30 minutes. Never again will I buy Poulan. Rated 4 out of 5 by Joseph from So far so good works just fine.... So far so good works just fine. Rated 1 out of 5 by Lilphil from Hard to start, will not restart I have had my machine for 3 years. Ever since I took it out of the package I have had issues. It's hard to start, and if you stop it and try to restart it it takes 12-15 pulls to get it going. Today, it just quit and now won't start at all. I will not be buying this brand again.